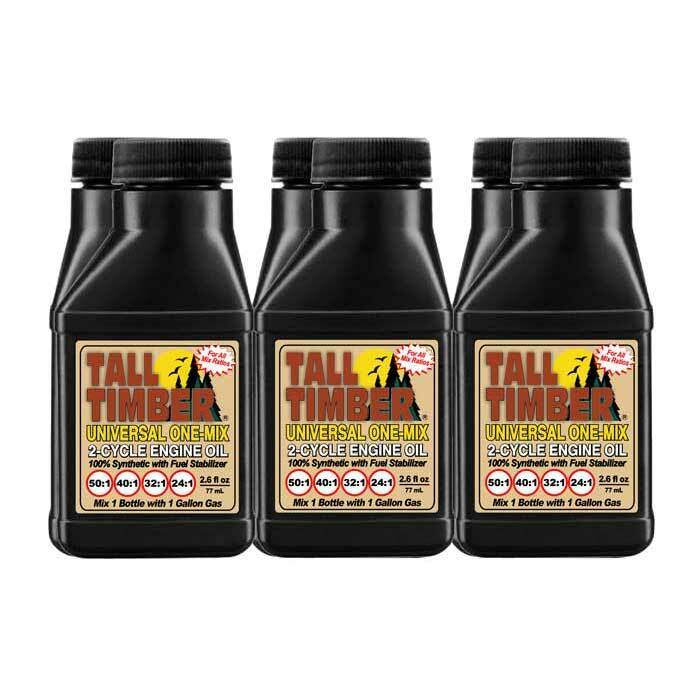 TALL TIMBER Universal One-Mix 2-Cycle Oil is a 100% Synthetic two-cycle, single mix ratio lubricant formulated for use in all two-cycle, air-cooled engines, regardless of brand, model, or mix ratio. Rated ISO-EG-D+, the highest rating available in the stringent International Standards Organization global 2-cycle performance ratings system. It is also rated JASO FC and exceeds the outdated API TC specification. Meets and exceeds all air-cooled 2-cycle engine equipment manufacturers rating requirements, and is formulated with high temperature detergent additives that provide cleanliness properties and prevent hard carbon deposits from forming in hot operating motors. The addition of high temperature, extreme pressure, anti-wear additives compounded with our unique synthetic oil formula ensures excellent lubricity which controls friction and prevents wear, plug fouling, ring sticking and exhaust port blocking. A single mix for all air-cooled two-cycle engines, so one gas can covers all two-cycle needs. Simple mixing – One Bottle to One Gallon Gas REPLACES ALL MIX RATIOS INCLUDING 50:1, 40:1, 32:1, 24:1. 100% synthetic and state-of-the-art additives increased performance and longer engine life. Smoke-free and low odor performance contribute to cleaner air and environmentally friendly operation. Fully compatible with oxygenated fuels. Contains a fuel stabilizer which will protect the fuel mix against varnish and gum for up to 6 months after mixing. Tall Timber Universal One-Mix with fuel stabilizer is designed for superior performance in high speed 2-cycle small air-cooled engines including, but not limited to, chain saws, lawn equipment, string trimmers lawn mowers, brush cutters hedge trimmers, blowers, chop saws, pumps, motorcycles, snowmobiles, ATVs, scooters and go-carts. Note: For premix only. Not for use in injector systems.